Is this a complicated mod? It's not too complicated and it saves a lot of time when working on bees! can anyone give me a hint on how to give my bees a proper name? they use their full refid somehow... I've looked into the code from "bees_color" and did exactly the same thing (with different products, colors, names etc. ), but I can't get the game to show their names normally, like color bees are shown. Hm, not sure what's wrong with your textures, might be this bug. 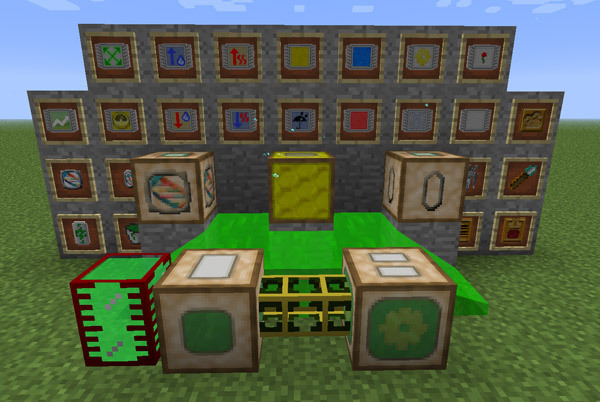 Im using the 1.11.2 version of this mod and i have a problem with the Mutagen Producer, nothing i try will make it work, it has power, i tried using redstone, glowstone, in item form or blocks, no mutagen is produced, if anyone knows how to make it work please share. No solution, but I am experiencing the same issue. Looks like it's broken, i'll look into it later today. Thanks for the report. Should be fixed in 1.6.5.5 (for MC 1.11.2). With regards to the creation of custom bees, would it be possible to create a video because despite its simplicity I'm still having issues understanding some aspects, a video would clear up a lot of these confusions and will allow less experienced players to create bees that they would like, thanks. Okay, new problem for me: the wiki doesn't specify what tier of IC2 power each machine can take. I've got a line of 2x insulated gold cables powered by wind turbine/kinetic generator combos (MC 1.10.2 still). The Mutagen Producer seems to be able to handle this just fine, but when I connected a Mutatron adjacent to it, the Mutatron immediately exploded (fortunately, the Mutagen Producer survived). Up to this point all machines were set to tier 2 (128EU/t) which is way too low considering how much energy they eat. For now I've increased it to 4 (2048EU/t) with the latest build. This is configurable (but globally, not per-machine). I'm not sure how to handle this in the long term. On one hand power tiers and explosions are an interesting mechanic that i'd like to support better, on the other most users don't use this mod with IC2 power and it doesn't really mesh with the other power systems in a reasonable way. I'll need to think about this. Well, IC2 was one of the first mods I ever installed for Minecraft (1.7.10 at the time), so its power is the one I'm most familiar with. I'm curious what other power sources you figure are more popular among other users for supplying Gendustry machines. The vast majority uses RF right now, with Tesla and IC2 having small(er) user bases. Going forward i expect more Forge Energy usage as RF dies out, and Tesla mostly superseded by it. From what I've found out about Forge Energy, I think the distinction between it and RF is only important to modders. Regular players (like myself) would be hard pressed to even notice said distinction, let alone understand it.